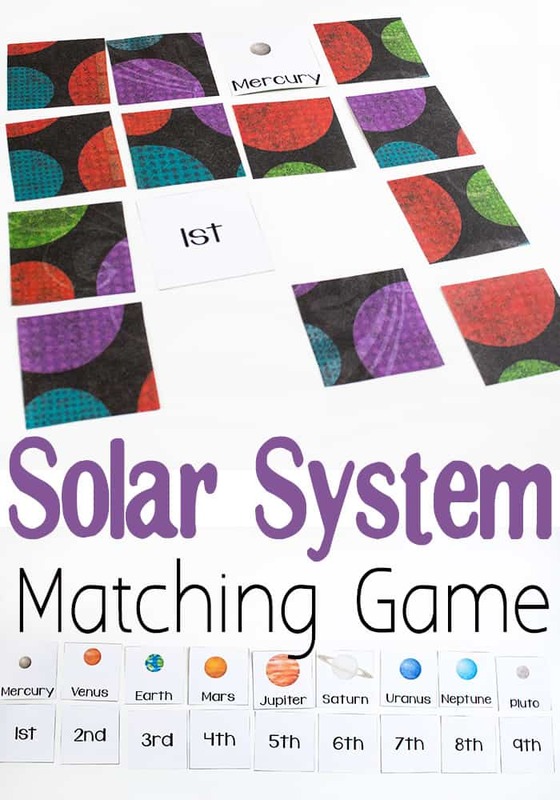 This free printable solar system matching game is out of this world! lol! Sorry, just couldn’t resist. My 2nd grader loves talking about the solar system and she is super happy that Pluto is a planet again. The cute little thing must have felt so left out… at least that’s probably what she was thinking. The 2nd grade blogging team is sharing solar system themed activities for you this week, so you’ll have some great resources for your explorations of outer space. To prep: Print the solar system matching game on the white side of the scrapbook paper (or on card stock), laminate and cut apart the cards. To play: In case you haven’t played Memory before, you turn over two cards at the same time. If they match, you get to keep them and turn over another set of trees to try again. 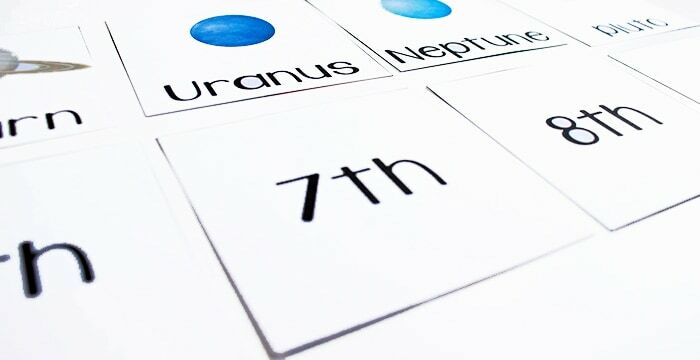 Extend your learning: You can also use the cards to make a “number line” of the planets. Place the ordinal numbers in order and then match the planets to the correct number. For fun, match up the planets and numbers. Then, have your child close their eyes. 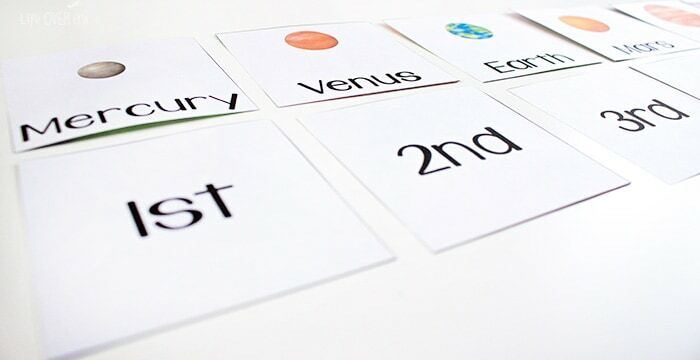 Remove one of the planet cards and see if your child can identify the missing planets. If you have a preschooler that wants to get in on the action, this solar system game for preschoolers is a perfect way to get him involved. Download the Free Printable Solar System Matching Game here. 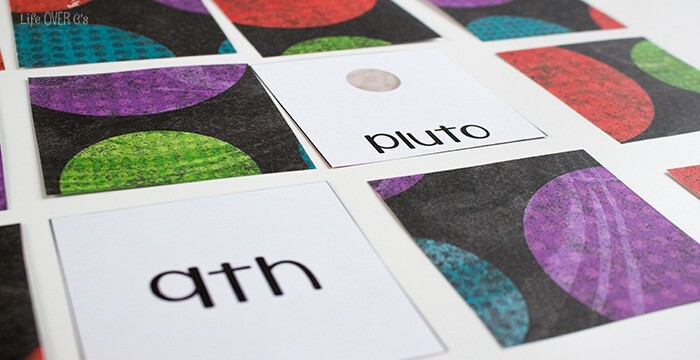 Free Printable Flashcards: Solar System Flashcards from Look! We’re Learning! Love memory! Such a great game to play to learn/reinforce material! This is such a cute game! Sharing! How cute! I think I would just stick to the planet for my two year old, but she would love this game! Pinning thanks!